The newest issue of The Armageddon Rag, the official newsletter of Fallout Online, is out and for your reading convenience is now being offered in a handy-dandy new Pip-Pad format. What, you ask, is a Pip-Pad? It turns out that back in the day, RobCo experimented with some larger versions of its classic Pip-Boy, developing a model with a much larger screen that was capable of display more information, at higher resolutions, than its famous wrist-worn hardware. The existence of the devices came to light when they were discovered in an old RobCo warehouse and while they suffer from a few bugs in the text processor, they look like they could quickly become the next must-have device for every hip, with-it warrior of the wasteland. The people behind the Armageddon Rag are doing their part to move post-nuclear techno-fashion along by distributing the latest issue of the Fallout Online newsletter on the device. Three stories feature in this issue, including a transcription of some Ghoulish rambling and a quick look at "the first announced playable race in Fallout Online," an action-packed tale in which "some Brotherhood apes get it in the end" and an introduction to Murphy's Law, a new column that not even the editors really understand but were nonetheless forced to run because all the regular contributors got caught in a bar fight. 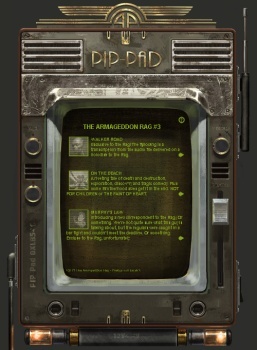 It's funny, it's informative and it's only in the Armageddon Rag, now available on the hot and stylish new Pip-Pad at interplay.com!